Warning! If you have a swarm of bees that are threatening the safety of you, your family or your neighbors, don’t hesitate – call your Tustin bee removal experts at Bee Busters! The area was mostly farmland and orchards before and was just developed into housing after the war ended. Due to this ecological feature, residential and even commercial properties in the city can experience bee problems. 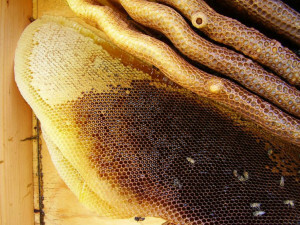 There are different types of bees that keep bugging people, and it takes a professional Tustin bee removal service provider to know what to do! Spotting where the bees have taken up residence is not always easy. More often, bees build inside a void space and they become nuisance. To resolve this pest problem, you need to locate the source of unwanted bees, wasps, and yellow jackets. 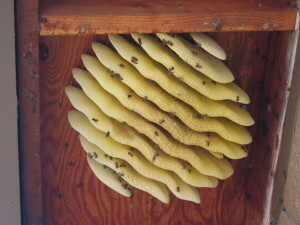 Beehive removal of the honeycombs and sealing the area can prevent another swarm from taking up residence. 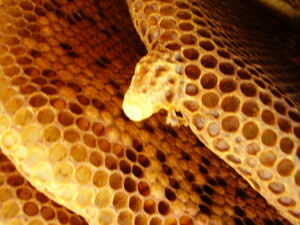 This also prevents damage from other pests or melting wax and honey. Bee Busters, Inc is a licensed Tustin bee removal service provider, regularly working in your community. We handle both residential and commercial rescue or extermination of these stinging insects using skills that are the most innovative in the county. Tustin Bee Removal: Instead of riling up that wild swarm of Africanized Honeybees, do the smart thing and be safe. Call professional services in Tustin, CA. We will locate and remove problem bees while educating you on prevention of future issues. Tustin Beekeeping: Learn about bee keeping from the experts. Our beekeepers have joined educational training, group seminars, and on site pollination services. You can buy local fresh honey from us. Keeping domestic bees makes a great hobby for all ages. Call us for more information. Bee Busters, Inc. is your licensed Tustin bee removal company for over a quarter of a century. We handle all types of bee rescue, hive removal and pest control services. Contact Us at 949-497-6264 for professional honeybee, wasp and yellow jacket removal services in Southern California.